Laura & Christopher share a romantic moment with a spectacular sunset on the beach. Rev. Jeremiah performs Laura & Christopher's wedding at Mauna Lani Beach on the Big Island. Photos by Robert Hamilton. 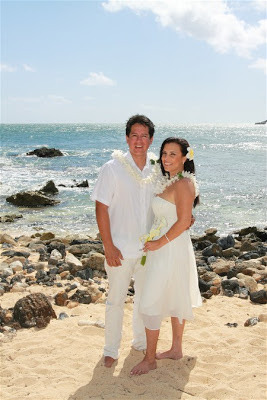 Kirk & Jean walk on the beach at Makena Cove on their wedding day. Wedding ceremony by Rev. Kimo, photos by JoJo. The scenery at Shipwreck Beach is hard to beat. Our most recommended wedding spot on Kauai! Coconut trees always make a nice tropical backdrop for the photos. See Rosa in our PRETTY BRIDES collection. 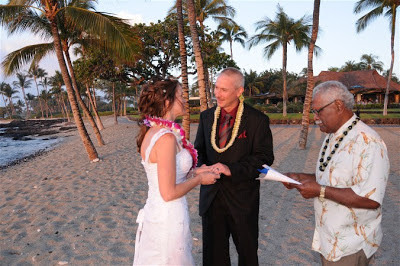 Pastor Harold performs Carlos & Rosa's wedding at Shipwreck Beach in Poipu, Kauai. Photos by Dennis.